That’ll do it for our live blog! Check back with us for a total recap of all the new products coming from Apple! Here’s the new iPad Air ad. And here’s Tim one more time. Touts more iPhone numbers and design. New iPad cover; same price, but different colors. All new covers and cases. Also powered by A7 chip. 4x faster at CPU tasks; 8x faster at graphics tasks. Comes in Silver/white. Space Grey/White. Starts at 9 and LTE/9. RETINA DISPLAY! 2048×1536 – same display as iPad Air! Video touting it’s integrity and durability; shows a chest level drop with no damage. A7 chip inside. 64-bit chip that’s also included in iPhone 5S. 2x faster than previous generation. Same with graphics; twice as fast. 72x faster than Original iPad. 2x increase in rendering. 2x faster at opening files. Faster Wi-Fi; first iOs device using Mi-Mo. 5MP iSight camera – 1080p HD Video. Dual microphones. Facetime HD camera. Comes in silver/white, space grey/black. Will replace full size iPad. 9 start/ LTE – 9. 20% thinner across entire device. Previous: 1.4 lbs. iPad Air: 1 lb. Lightest full size tablet in the world. New iPad – biggest step in iPad yet. Thinner, lighter, and more powerful than before. Here’s Phil to talk about the new iPad. Now showing a video of all the ways customers use their iPads. 475,000 iPad apps in App Store. iPad usage: 81% of market. Over 4 times more than all other tablets. iPad sales – one of the most successful products in Apple history. Earlier this month, sold the 170 Millionth iPad! …and here’s Tim Cook. You know what time it is. All new productivity apps available free today with the purchase of new iOS and OS X devices! Easier to share documents in iWork than before; even without iWork on Mac and PC. Collaboration added to iWork for iCloud! iWork completely rewritten from ground up. Full file compatibility between devices with brand new UI. Pages – focus more on content, not on editing. Numbers – object-based design. Interactive charts. Keynote – “Gold standard of presentation apps”. New Keynote has run the entire presentation. Update realistic physics for transitions. New iLife FREE with purchase of new OS X and iOS device. Wow – A smart Drummer track added in new update for Garage Band on Mac! iLife – new versions of iPhoto, iMovie, and Garage Band. iPhoto – faster browsing, new look for iOS. Bringing photobooks to iPad. You can upload and send to Apple to print and ship coffee table book. iMovie – clean and simpler for iOS 7. Select and tab share. Desktop-class effects to picture-in-picture to all iOS devices. For Mac, high feature editing, and iMovie Theater. Create a movie on iPhone, shared via iCloud to all devices. Garage Band – all new look! 8 to 16 Tracks. Up to 32 tracks on Mac. New look and design for Mac, as well as new sound library. Manufacturing of Mac Pro is solely based in the United States. Pretty incredible for the price point. ….and now a video of the production process. Cost: 99 – starting at basic config. Available in December. Intel Xeon E5 – 6,8,or 12 Core processor. Dual Workstation GPU’s – AMD FirePro. Next-Gen Flash storage. 10x faster than a hardrive. Up to 1TB of storage. Thunderbolt 2 – 20Gb/s throughput. 6 devices per port. Display – up to 3 4K displays. Auto configured. Basically…this is the hoss of desktop computing and expansion. 13″ MacBook Pro – thin and light, powered by intel Haswell chip including Iris Graphics; 90% faster graphics. 9 Hours of battery life. Touts that you can watch the entire Dark Knight Triology on one charge. PCIe-Flash storage. 802.11ac wifi. Thunderbolt 2; twice as fast. Will run OS X Mavericks. Previous cost: 99. Cost today: 99. Ships today. 15″ MacBook PRo – Updated graphics and processor; twice as fast as before. Up to 8 hours of battery life. Also includes new Flash, WiFi, and Thunderbolt. Previous cost: 99. New cost: 99. Touting MacBook Air as best reviewed Mac ever made. Now, the MacBook Pro with Retina. Easy and simple upgrades to ALL current OS X users. And that’s the Mavericks demo; touting battery life, memory extension, and usage. Now talking about reinvented distribution and pricing: MAVERICKS IS FREE! Calendars are now completely time and location aware; fully integrated with every aspect of the OS. Updated notifications in Mavericks. Great new features; updated from previous features using iCloud of course. Mavericks is designed to get more out of your hardware, battery, GPU, and CPU..even with multiple displays! YES! New Mac Apps: Maps, iBooks, many more. Nice! The demo for Mavericks is really nice. Lots of great new features. Lots of updates about apps and iLife. Apple is apparently having problems with their own live stream; no status on when it will be up. We’ll still have all the info you need right here. Smaller design, but still larger than the mini. Updated features to mini, but no Retina display…although they should. TouchID will be available on both. We are just moments away from the start of Apple’s October 2013 Event! Stick with us! Hey folks! Josh here with your coverage of the October 2013 iPad event! Check back soon! That’s it, folks! Thanks for hanging out with JustUs Geeks today. Keep it locked in for all the news your brainlumps can handle and be on the lookout for episode 77 of our podcast early next week, where we will surely talk about the 5S, 5C, and everything in between. Goodnight everybody! Just a correction: we didn’t mean to make it seem like a preorder would not be offered on the 5S. Both the 5C and 5S will be up for preorder on Friday, September 13. Looks like it’s not more news, just a tune or two from Mr. Costello. Elvis Costello is on stage with Tim Cook. “Before we close, I’d like to return to music.” Uh oh…..
Time to watch a new ad! Cook is back out to wrap things up, it seems. Our live blog doesn’t like us very much. Let’s try it this way: 199 for 16 GB, 299 for 32 GB, and 399 for 64 GB, available September 20.
iPhone will be in 100 countries and on 270 carriers by year’s end. Launching at the start in China, for the first time. Sorry, 9 for 16 GB, 9 for 32 GB, 9 for 64 GB, preorders open on September 13, phones will be available on September 20. Starts at 16 GB for 9, 9 for 32 GB, 9 for 64 GB. Schiller is back on stage, doing an overview of the three new technologies: A7, Camera, and Touch ID. Video time with Jonny Ive! Fingerprint can also be used for apps, like to authenticate iTunes purchases. 1984 called, and yes, it’s still scary. Steel ring around the home button is the “detection ring” which turns on the sensor. Touch ID sensor is 170 microns thin, senses 550 ppi, scans your sub-epidermal skin layers. Built right into the home button. Touch ID. “Uses a key you have with you everywhere you go.” Fingerprint! “Third feature is all about security.” Here we go! Iphone can adjust exposure automatically as you pan in panorama mode. Captures HD video at 720p at 120FPS. Slo-mo is in as well, up to 120 fps. The phone analyzes the burst photos in real time so it can present you with what it thinks is the best shot automatically. Wow! Combines multiple photos taken for light levels, then picks the sharpest one. New burst mode shoots in 10 frames per second. Side by side photo is shown with the new flash. Skin tones look much better. Auto image stabilization is coming too. New camera takes multiple photos and the software actually picks the best one. New Flash has two LEDS, which is why it’s wider, one is cool and white, the other is warm and amber. 15% larger active sensor area. New iOS 7 software has been designed to take advantage of the new sensor. They’ve designed a “new, five-element Apple-designed lens” with an F2.2 apeture. Schiller says it’s better than the 5. Now moving on to the camera system. It can tell apps if you’re stationary, walking, driving, etc……Big Brother is watching you, and he knows if you’re fast or slow. Continually measures motion data, meaning a new era of health and fitness apps. Sounds like a battery drain to me. There’s a new part, the M7, the “motion coprocessor”, which works with the A7. Available in the App Store, along with the new iPhone 5S. Granted, the demo looks great, which is predictable, as is the fact that this version that will it’s standard barely comprehensible “storyline”. Yep, they are showing off Infinity Blade 3. Co-Founder of ChAIR is out….why do we always demo a new phone with something from these guys? Over twice as fast as iPhone 5, graphics are 56X faster. Runs OpenGLlES 3.0, like the new Nexus 7.
iOS 7 apparently runs in 64 bit. Brand new A7 chip. First ever 64 bit chip on a smartphone. There is indeed something around the home button, like a silver ring. Slate is now being called “space gray”, there may be a tint change. Bigger LED on the back near the camera, but not a second LED flash. Official colors: Slate, Gold, Silver. Typical Ive quote “The 5C is beautifully, unapologetically plastic.” What does that even mean?! Now for another video of the 5C, with our FAVORITE Apple employee, Jonny “Simply Stunning” Ive! Magic numbers: for 16 GB, 9 for 32 GB…..means 5S may be more expensive though. Supports more LTE bands than any other smartphone in the world…and that’s just the budget model! New Facetime HD camera comes in the iPhone 5C. Steel reinforced INSIDE, which also serves as a new antennae. Same processor as iPhone 5, larger battery than the 5. same 8 megapixel camera….can’t wait to see the upgraded 5s! Phone is made of hard-coated polycarbonate material. In other words: PLASTIC. Cases have circular holes to let the color underneath show through. Apple will offer custom cases created with “Soft-feel silicon rubber”. Background images on the phone are customized to each phone’s color. Colors offered green, white, blue, pink, and yellow. No surprises here. Video now showing for the 5C. “In the past, when we introduced a new iPHone, we lowered the price of the old iPhone. This year, we’re not going to do that. This year, we’re going to replace the iPhone 5. With not one, but two new designs.” Schiller is on stage! That is huge news! Apple is looking to make it’s devices the premier creative gadgets. Wow…..Apple just made iMovie, iPhoto, and the iWork suite free with any NEW iOS device! Now talking about creativity apps, like iPhoto. iWork gets a little time to shine. iOS 7 launches September 18th! It can’t be here soon enough! Developer community is on board and inspired. Evernote, Zillow, and Open Table were some of the ones mentioned. Now showcasing the “share sheet” that makes sharing via Twitter or Email easier, plus Airdrop. Actually, that’s a pretty big deal, new sound sets. We are getting new, more textured ringtones! System alerts sounds have also been improved. Now showing how Siri can search Tweets. Siri has Wikipedia, inline web search, and a photo search. Going over some of the features of iOS 7, like lock screen, layout of the home screen, talking new features. Craig Federighi is on stage to talk iOS 7! Showing off new store in Stanford, CA. Now showing a video about the Festival. iTunes Festival is being live streamed to over 100 countries. Apple doesn’t charge for tickets so 20 million people have applied for them. Tim is talking about iTunes festival now, which is up for it’s seventh year. Tim gives a very special welcome to people in Beijing, Berlin, and Tokyo….hmm…..curious…. Our liveblog coverage of today’s Apple event begins….NOW! Tim Cook is on stage. Check back at 11:45 a.m. as we get the ball rolling! You can tweet us or send a comment via the site and we’ll try and include it in the pre-game! Be sure to check us out all week, especially on Friday for episode 31 of the podcast, recorded LIVE at KC’s Espresso in Corinth, MS. Thanks for hanging out with JustUs Geeks today for this liveblog. As always, we try and give you the best of the news. Thanks journalists for coming, tells crowd about hands on area…and that’s a wrap! Thanking all the teams at Apple. Seems to be wrapping things up. Says that he hopes that Apple kept the promise of innovation they promised early on this year. Tim Cook back out to wrap things up, probably. Preorders begin Friday for 4th gen and Mini, shipping November 2, cellular one week later. 9 starting price for cellular configurations of the new iPad mini. Prices starting at 9 for 16 gb…a little high, don’t you think? Our esteemed @jaredwallin is NOT happy about the 4th generation iPad. Tune into the podcast this week and listen to him go off! Almost the entire inside of the Mini is it’s battery. Video shows off new Smart Cover, eliminated aluminum hinge, which is now colored just like the front cover. Now showing a video highlighting all the features of iPad Mini. A5 chip, Facetime HD camera, 5MP iSight camera on the back, ultrafast wireless and LTE, Lightning connector, 10 hour battery life. Equal to or better than the ipad 2 in every way. Now comparing apps between the tablets, showing the difference in native iPad apps and scaled up phone apps. 50% larger for surfing the web compared to Android’s presentation in portrait. 67% larger in landscape mode. 35% larger display on iPad Mini compared to Nexus. Now comparing iPad Mini and Galaxy Nexus. Say bye-bye to iPad 2 as of today. 7.9 inch screen, compared to iPad’s 9.7. 1024X768 pixels on both iPad 2 and new iPad Mini. Black has a slate back, just like the new iPhone. 7.2 mm thin, 23% thinner than iPad…as thin as a pencil. 53% lighter. .68 pound. As light as a pad of paper. Schiller demoing iPad Mini live on stage…it can be held in one hand. Not shrunken down iPad, but an entirely new design. It is officially called the iPad Mini. 2x Faster WiFi, lightning connector, showing cables we tweeted about earlier. 10 hour battery life, Facetime HD camera, expanded LTE, working with multiple cellular carriers. A6X chip, doubles speed and graphics performance. Next generation ISP. 4th generation of iPad. Seriously?! Phil Schiller back out to show new iPad stuff! 94% of Fortune 500 companies are testing or deploying iPad into their businesses. iBooks Author update is a free update on the Mac App Store, available today. New iBooks Author update, allows more customization: new layouts, widgets, equations, etc. iBooks textbooks are now available for 80% of the US core curriculum. People love iPad. There’s a no brainer. Apple sold more iPads in the June quarter than any manufacturer did of their ENTIRE PC LINEUP! Remember when people said that tablet computing wouldn’t work? 2 weeks ago, Apple sold it’s 100 millionth iPad. Tim Cook back out, now talking about iPad. Here we go. 27 inch base model starts at 99, begins shipping in December. Begin shipping next month in November. 21.5 new iMac starts at 1 TB HD, 8 Gb memory, 99. OS and pre loaded apps automatically put on flash, not HDD. Smart system figures out what you use most and moves it to flash so the apps are faster. Apple Fusion Drive announced, 128 GB flash storage plus a 1 TB or 3 TB HDD meshed together. Mountain Lion works seemlessly with it. Up to 768 GB flash memory, 32 GB RAM, up to 3 TB HDD and NVIDIA Keplar graphics, SD card slot is now on the back. 75% less reflection on screen, all displays individually calibrated. Screen is fully laminated to the glass. Display system is 45% thinner. No optical drive. There’s where the 80% was. 5mm edge, 80% thinner from previous gen, extends the entire length of device. New iMac on screen, impossibly thin. Introducing new iMacs now…crap, @martyestes just bought one. New Mac Mini’s start shipping today. Prices starting at a base line 9. Now showing updated Mac Mini. “You knew there’d be something called Mini in this presentation, didn’t you?” ~ Phil Schiller, moving on to talk about the Mac Mini. Higher end 13 inch Macbook Pro is 99. Prices starting 99 for 128 GB, 8 GB Ram, and 2.5 Ghz. Shipping today! Facetime HD camera, dual mics, stereo speakers, backlit keyboard, glass covered multitouch trackpad. Pretty standard. 13 inch Macbook Pro shows almost 2 million more pixels than an HD TV. 2 Thunderbolt ports, USB 3.0 ports. No optical drive, SD card reader, HDMI out. Most importantly, retina display. .75 inches thin. That means it’s 20% thinner. 3.57 pounds. A pound lighter. Brand new 13 inch Macbook Pro announced. 13 inch Macbook Pro is the #1 selling Mac across the board. Schiller is starting with Macbook. Cook promises to continuing innovating with the Mac. Phil Schiller is out now to show us some new stuff! Now shifting to the Mac. It’s in it’s 6th year of growth over the PC industry. New iBooks is a free download available today from the App Store. Also includes the ability to highlight a quote and immediately share to Facebook and Twitter. New version of iBooks today! Continuous scrolling! Integrated with iCloud! 1.5 million books available on iBooks, 400 million downloads. 6 and a half billion dollars have been paid out to app developers. 35 billion apps have been downloaded from the App Store. 160 million users of Game Center. 300 billion messages have been sent with iMessage. In just one month, over 200 million devices are running iOS 6. Apple has already sold over three million units of the new iPod Nano and Touch. Moving on to new iPods. Now showing a launch weekend video made by Apple about the iPhone 5. Giving updates on current products first: highlighting iphone 5 selling out on first weekend. If you’re tracking with us today on the site or twitter, thanks for choosing JustUs Geeks for your info! 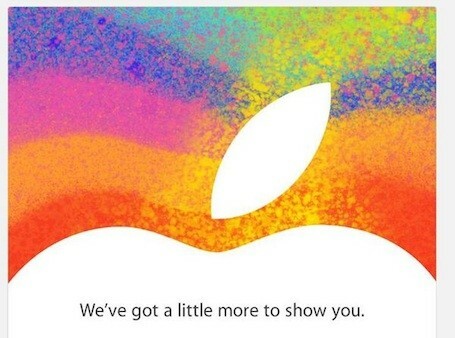 Ok, twitterverse….what are you most looking forward to or hoping for from the Apple event? Also, the new power adapter is 12w, up from 10w. Faster charging, anyone? They will be lightning to USB camera adapter, SD card reader, vga adapter, and digital av adapter. 4 new Lightning cables will be released at today’s event, according to 9to5mac. The Apple online store is down ahead of today’s event. That means that goodies are on the way! Just a head’s up, we will be live tweeting Apple’s event today starting at 12 CST. Thanks for hanging out and putting up with us this morning! 66 days and counting! Closing up now, with a video of lots of upcoming games. “How U Will Play Next”. That’s the slogan, folks. Over 50 games promised between November 18 and March of next year. Too early to guarantee launch day games. Really?! Non-linear, choice based campaign, zombies in Black Ops 2. Split screen is done via television and touchpad. YES! One is actually playing on the tablet….hope that is something that can truly happen, not just for an onstage demo. Guys from Activision up to do a live demo of Black Ops 2 multiplayer. graphics look as good or better than current gen consoles. Now doing a live demo of Call of Duty Black Ops 2. Transformers Prime game will be exclusive to Nintendo platforms. Touchscreen and tilt controls on Skylanders Giants. Previewing Activision titles now…Skylanders Giants, Transformers Prime, Wipeout 3, 007 Legends….I am officially geeking out for the Prime game! Activision CEO on stage to promo their upcoming Wii U games. Monster Hunter 3 Ultimate coming in March for Wii U and 3DS. New trailer now being shown for Platinum Games’ The Wonderful 101. Looks like a mixture of Pikmin and superheroes…which is a good thing! Back to games….Platinum Games up first…showing new trailer for BAYONETTA 2!!! Nintendo Tvii will be display for attending journalists today. Mii in the upper left hand corner….personalized experience for each member of the house. On demand connects to Amazon Direct, Hulu Plus, and Netflix. Zach Fountain on stage now to demo Nintendo TVii. Shows game stats, information, field position, and more, all live. Works as a remote for your television as well. Showing preview now…gamepad acts as a sort of media hub, including on demand services, TiVO, and sports stats. Nintendo expanding entertainment experience by announcing Nintendo TV. Reggie back up, talking about something “completely different” for Nintendo. Chase McCain minifigure offered as a pre-order bonus. Now showing Lego City: Undercover. Graphics look really good. First completely original Lego game. Integrated with Miiverse, showing completed challenges on the map. Boost Rush mode being shown, that’s where the block placement on the pad comes in. Challenge mini levels also being added. New Super Mario Bros. U being shown. New map system for game: a completely interconnected map, ala Super Mario World. Full range of Nintendo attractions being shown today. Two additional modes mentioned, ground vs. air, and ground only multiplayer free for all. Player’s Mii’s are dressed in the Samus suit and heads stick out of the Samus ship. Essentially it’s a horde mode/escalation type game using Samus’ abilities and tech. Graphics look very good. Metroid Blast being shown. Third person shooter, cooperative play with player on ground as Samus, Tablet player uses Samus’ ship. Now showing Metroid attraction in Nintendoland. Wii U branded Nunchucks and Wiimotes will be sold alongside WiiU. 9.99 for Basic set, 9.99 for deluxe set. Deluxe set includes all that plus stand for pad, Nintendoland, and subscription to online services. Basic set. White. Console, Gamepad, AC adapter for each, HDMI cable, and Wii U sensor bar. 2 different configurations available on November 18. Reggie now talking about innovation, how Nintendo attracts people to it’s products through innovation. Now that’s how you start an event! Launch day is Sunday, November 18, 66 days away!!! 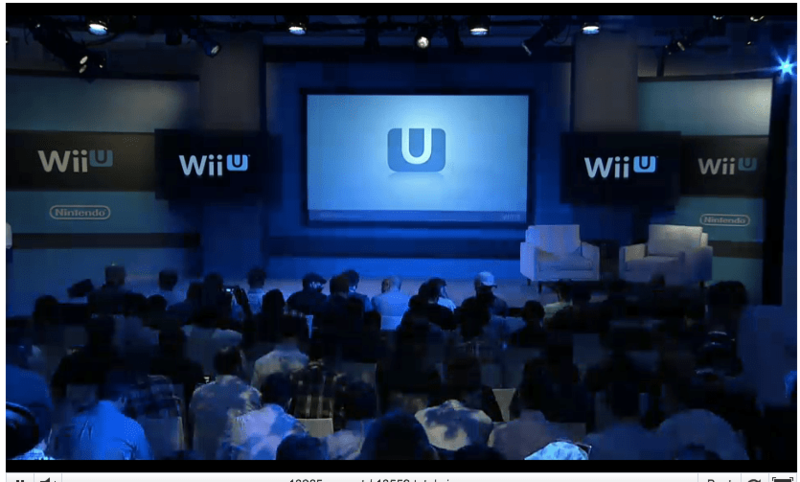 The stream has gone to a blue screen with the Wii U logo, presumably so they can set up all the “magic” on stage. Alright, twitter peeps: what do you most want to see Nintendo talk about or release today? The screen has come alive! Joystiq has just reported that someone at the event in NY has confirmed Call of Duty Black Ops 2 for Wii U. Just under thirty minutes left until Reggie takes the stage. I’m listening to a little of The Protomen’s Act II album to get pumped. Anyone else out there? Thanks for hanging with us for the liveblog! Keep checking www.justusgeeks.com for more SDCC news! My question: where is TF: Prime Breakdown?! Why have we not seen hide nor hair of him? Now for some Q&A – fans want triple changers, they say they are considering it. and for letting us see these awesome pics. Thanks guys! In August new product launches with Generations deluxes, cyberverse vehicles, new Prime, etc…. Linkin Park designed a Transformer? (Marty) I called it! SDCC 2012……we get FoC Grimlock!!!! New Blaster! Rewind, Eject, Rampage, and Steeljaw all come with Blaster! A retool of FoC Soundwave! Generations 2013 preview: deluxe wave 2 Impactors Twin Twist and Topspin! Translucent, new faction logos. Knockout, Starscream, Wheeljack, Megatron, Prime. BBTS will get exclusive Dark Energon series. Scout Sandstorm, Dead End, etc, and Deluxe Springer, Swerve, etc, all at TRU. Silverstreak, Hoist, Motorbreath, and Thundercracker will release in October at Toys R Us. Asia Generations Exclusives will be released at US retail! Hallelujer! Will also release First Edition Arcee, Starscream, Terrorcon Cliffjumper, and Vehicon. Prime First Edition Entertainment Park will be released, as will Voyager Bulkhead and Prime. Big Bad Toy Store and Amazon get G2 colored Fall of Cybertron Bruticus. They have now moved on to retailer exclusives. The first is Amazon Exclusive Jetwing Prime. Releases in November. The team is now explaining how they designed 2012 Bot Shots Bumblebee. Now Bot Shots. 2012 has 24 singles. In 2013 we will get Jump Shots, Spin Shots, Flip Shots, and Blitz Shots. Not sure what those are except fun! Cyberverse Legion wave 4 includes Fallback, Skyquake. Prime Powerizer Thundertron and Ultra Magnus being shown. Skyquake will be in wave 5. Other combiners include Superion, Devastator, and Bruticus. Now showing Predaking *ahem* I mean Predicus Microchange combiner. Now Kreo: Spring 2013 sneak peak. Kreon Microchangers Blast Off, Rampage, Hook. Kreons that Transform! Clear translucent plastic weapons with the Energize theme. New theme for Spring 2013, Energize. Now showing Rescue Bots Bots and Robbers Police HQ. My son is going to love this! Showing pics of Evac now, both the ride and the exclusive toys that you can get at the ride locations. Fans are clamoring for a Metroplex toy….panel speakers said “Stay tuned….” ZOMG!!! Hopefully we will have pics from the presentation too, so keep a look out for those. Hasbro team is still looking at getting the last wave of Dark of the Moon to retail in the US. Soundwave FTW!!!! New episodes of Transformers Prime are coming this fall. Panel is talking about theme park ride at Hollywood and Singapore. Team sees upcoming figures as a relaunch of the Generations subline, which will contain 40 toys. Those in attendance are voicing their displeasure of the Powerizer figures and their gimmicky weapons. The panel has started with technical difficulties, so they are doing Q&A. This panel will be hosted by Aaron Archer and Jerry Jivoin, who is the global Transformers director, among others. Panel is about to start in 5 minutes. If you have any TF related questions, ask us and we will answer on tonight’s podcast. What are you excited to see? What do you think Hasbro will reveal at during the panel? Just a warning for everyone, we will be tweeting this liveblog. Sorry if it clogs up your feed! #MicrosoftSurface – And that’s it. Besides showing this thing off, we’ve gotten no price point and no firm availability date. #MicrosoftSurface – NO PRICE POINT ACTUALLY GIVEN! #MicrosoftSurface – When the cover is folded back the Surface will power down. Sound familiar anyone? #MicrosoftSurface – Lots of focus on design; almost Apple-esque. This was made out of VaporMG. #MicrosoftSurface – And now hardware fades to the background. #MicrosoftSurface – Talking about the development process now; months and months of prototyping. #MicrosoftSurface – Now showing an actual keyboard in a cover. Full line-up now on stage. #MicrosoftSurface – Mike Angiulo on for the demo. #MicrosoftSurface – The Pro version has a stylus, or what they are referring to as “digital ink”. #MicrosoftSurface – Here’s the Pro version. Noticably thicker. Comes with Ivy Bridge processors from Intel. #MicrosoftSurface – and another Suface? Surface for Windows 8 Pro? Weird….one for every OS? #MicrosoftSurface – Two versions: Windows RT and Windows 8 Professional. INTERESTING. #MicrosoftSurface – The COVER is the keyboard. WOW! #MicrosoftEvent – “Why shouldn’t we make the surface a full keyboard?” Full surface can be full sized keyboard. Weight is roughly 1.5 pounds. #MicrosoftEvent – #MicrosoftSurface second image… Also, a magnetic connector for the cover. Hmm…that’s totally a #SmartCover rip-off, but it still looks great. #MicrosoftEvent – #MicrosoftSurface specs: 9.3 mill, full size USB port, full magnesium case…. #MicrosoftEvent – “It is a tool to surface your passions and creativity.” Now Steven Sinofsky is out. #MicrosoftEvent – Tablet! The Microsoft Surface! #MicrosoftEvent – Lots of stuff about mice. “With Windows 8, we didn’t want to leave a seam uncovered. It’s a whole new family of computing from Microsoft.” …and video. #MicrosoftEvent – “Hardware and software push each other. Let’s take a look back at the role of hardware at Microsoft.” ….and now a video rolls. #MicrosoftEvent – Steve Ballmer is out; SHOWTIME! #MicrosoftEvent – Just received a warning about no video during the presentation; should almost be time. #Microsoft – Now they have given out these cards to those in attendance. This is currently displaying on the screen in the #Microsoft conference center. Still haven’t gotten rolling….will update shortly. Stick with us! And that’s it, folks. No new iPhone or TV. But for 4s and all new iPad owners, the updates to Siri are incredible. We’ll keep you posted on new images of the new MacBook Pro and Air when the Apple Store comes back online. Wrap up: Next-gen MacBook Pro. Mountain Lion .99 in July. iOS 6 in the fall with new Maps app. Tim Cook back for review……hmmm. Fall release of iOS 6…..Wonder what that means…. iOS 6 ships to everyone else in the fall. iPhone 3GS and later, 3rd and 4th gen iPod touch, iPads. Beta that is….Beta version for Devs today. Devs get iOS 6 today. DANG DEVS! Here’s Lost Mode: If you lose your iPhone, send a phone number to that phone. Finder taps it to call you. 200+ new feature in iOS 6. Better privacy. Game Center challenges. Lost Mode. Made for iPhone hearing aids. IPHONE HEARING AIDS?!?! Shows off turn-by-turn directions. Tap QuickRoute button, pick a route, start. Siri tells him where to turn. Shows buildings. Counts down feet. ETA updated. Kids can ask “Are we there yet?” and Siri tells them, “Relax and enjoy the ride. You’ll get there in 14 minutes.” WOW! Shows Flyover of Transamerica Pyramid. Renders in real time, you can change the angle, etc. Flyover feature in Maps has 3D photographic models of lots of places. Awesome new feature for Maps: built in turn-by-turn navigation with traffic and ETA. Slows down? Offers reroute. Traffic view, with incident reports overlays. So you know if it’s just busy or shut down for an accident. Anonymous real time crowd sourced data. Kinda creepy; very cool. Guided Access useful for lots: examples – Teachers (esp for tests in iBooks! ), museum kiosks and tours, etc. And now a Passbook demo: Shows Amtrak boarding pass. United Airlines. Target coupon. “Shreds” a card when you no longer want it. Mail for iOS 6 gets a VIP feature. You can notifications for important emails, just like text message. Starred in message list. VIP inbox. Flagged Mailbox also included in iOS 6. Now – PhotoStream. Shared photo streams. Choose photos, choose friends, share. They show up in an album. Comments. Shared Photo Stream photos show up in an album. They allow comments. And they work across iOS, Mac, Apple TV. New: “Smart App Banners – shows you a link to a native app when you go to a mobile site. If your app is already installed, tapping the Smart App Banner will switch to that app, right where you left off on the site. Full screen support in Safari on iOS 6, in landscape orientation. Safari gets iCloud Tabs (like ML) and Reading Offline. FaceTime unifies phone number and Apple ID, so if someone calls your number you can answer on iPad or Mac. Same with Messages. 2nd best thing today (for me): FaceTime. In iOS 6 it will work on the cellular network. No more Wi-Fi requirement. BUT…on that same token: You can create a group whose calls ALWAYS get through. For emergencies. Or repeated calls: 2nd call in 3 minutes will come through. Incredibly well thought out. Or as @emilysteen says…make sure you miss those light night emergency calls. New feature: Do Not Disturb. Tell your phone not to make noises while you’re sleeping. No light or sound, but the messages will of course be there later. The reminders are In 1 Hour, When I Leave, When I Get Home, and When I Get to Work. PERFECTION! Incoming call gives options to Reply with Message, or Remind to Call Back Later…for those of us who hate to talk on the phone. New enhancements for the phone app. See which apps, movies, music, etc (that Apple sells) that your friends like. Shared contact info shows up in Contacts. FB events and birthdays will be in your Calendar too. Post to Facebook and Twitter from iOS 6’s Notification Center too. Nice feature. Post photos to FB from Photos, websites from Safari, talk up apps in App Store, media in iTunes Store, etc. Here comes Facebook….same intergration as Twitter. Log in once and never again. So in iOS 6, Siri is in iPhone 4S AND THE ALL NEW IPAD! ROCK! Local search in Siri going worldwide. Siri now knows new languages. Spanish, French for Canada, Italian, Switzerland, Korean, Mandarin for Taiwan, Cantonese for Hong Kong, and both for China. Companies include: BMW, GM, Benz, Land Rover, Jag, Audi, Toyota, Hyundai, Honda. WOW. Apple is now working with car manufacturers to add a Siri button to the STEERING WHEEL. Doesn’t light screen, eyes-free. And the best thing I’ve heard all day…SIRI CAN LAUNCH APPS NOW! Hallelujah! REJOICE! Even better for date night, Siri now knows what’s playing at your local theater. Posters, ratings, RottenTomatoes score, even watch the trailer w/o leaving Siri. Goodbye #Malco app. Food Geeks: this is for you. Restaurant listings improved. Sorted by rating, shows $$$ for average price, make OpenTable reservation, see Yelp reviews, etc. Siri Knows Sports. You can get scores. Shows the scoreboard. SPORTS GEEKS REJOICE! And now…iOS 6! Significant enhancements to Siri. 75% of iOS customers are “very satisfied.” Less than 50% for Android, less for RIM. 130 million Game Center accounts. 5 billion scores submitted per week. 2/3 of top 100 games use it. Twitter has seen a 3x increase from people on iOS since it was built in. iOS 5 has sent 10 billion tweets and 47% of the photos shared. 150 billion iMessages sent by 140 million users. 1 BILLION PER DAY! 84 of the top 100 social apps use Push notification. 7 billion sent a day. 1.5 trillion so far. 365 million iOS devices sold through March 30. More than 80% of customers are running iOS 5. Hear that, Android? Only 7% of customers are running the latest version of Android. Now up – Scott Forstall & iOS 6! That’s for upgrades from Lion or Snow Leopard. Single purchase of .99 will upgrade all your Macs. Free for new Macs bought from today. Mountain Lion ships in July. PRICE: .99!!! WOW! Added lots of features for users in China. Promotes Apples growth in China. Mountain Lion offers 200 new features. Mail VIPs, Gatekeeper, Offline Reading…. Play a cross platform game from one device to another and stream through AirPlay to your TV. Epic. Now a demo of AirPlay and Game Center in Mountain Lion. Sorry….left out turn-to-turn gaming and head-to-head gaming is CROSS PLATFORM….basically fully uninterrupted gameplay. AirPlay Mirroring. 1080p from your Mac to hockey puck Apple TV. AirPlay speakers as well. Also backs up to Time Capsule if plugged in. NEW FEATURE: Power Nap. Keeps your Mac up to date while in Sleep Mode. Email fetch, reminders, photo stream, calendars, etc. You can have Twitter use the notification center system too. You can even “summon a Tweet sheet”. Even tweet dication. Sharing in full screen apps. Share a pic from iPhoto to Messenger. App stays full screen. Navigate tabs with gestures. @martyestes loves him some gestures. iCloud tabs in Safari: See what you have open on your other devices. Nice! Share on Twitter, Messages, etc, from anywhere, just like in Safari on the iPhone. Sharing built in across the system. Quick Look an image, share to Flickr. Slide the desktop to the left to see the Notification Center like you can do on your iPhone. Connect to a projector: alerts and banners auto-disable. Awesome touch! Notifications, like iOS, coming to Mountain Lion. Documents In The Cloud: Drag docs right into the “In The Cloud” dialogue. Super easy! Messages now supports 100MB attachments and HD Video. Notes now supports images and links; can keep notes on desktop. Location based reminders now work with Mountain Lion….interesting. Gives you options for “In The Cloud” or “On My Mac” for storage. iCloud support built in to Mountain Lion. All the Apple apps have it integrated. Also adds Messages, Reminders, and Notes. Plus Documents in the Cloud. Optimized for multi-touch trackpads….and mice! Time to talk about Mountain Lion. New MacBook Pro STARTS at 99 with 8GB of RAM 256GB of storage. NO 17″ models! No cover glass on the display. Cool. Video of new MacBook Pro starring SIR Johnny Ive. Thunderbolt Ethernet Adapter now available. New ports include: SD card, HDMI, USB 3/2, TWO THUNDERBOLT, a thinner MagSafe 2, headphone. Quad-core i7 processor, up to 2.7GHz. Up to 16GB of memory, 1600MHz. Kepler graphics GeForce GT 650, up to 1GB of VRAM. Flash storage up to 768GB!!! 7 hours of battery life and 30 DAYS OF STANDBY TIME. WOW! “Everything inside this next-gen MBP has been redesigned” to push performance. Lion and Apple apps have been updated for Retina Display. Reduced glare and reflection by 75%. THAT IS HUGE! RETINA DISPLAY! 2880 x 1880. WOW. Check back here at 12 Noon Central time for the JustUs Geeks live blog of the WWDC keynote address. What’s up! Josh here, ready to take you through our first LIVE BLOG of WWDC. 11:55 – We’re about ready to get going. 12:04 – CEO Tim Cook takes the stage. 12:05 – AppStore Update – over 400 million accounts, 650000 apps, 225000 apps for iPad. 30 BILLION apps download. 12:08 – Video about Apple, it’s reach, and touching lives. 12:09 – Video shows a blind man using a GPS app on an iPhone to navigate through the forest. Cool stuff. Also, iPad-to-projector of of school classroom in Mumbai. 12:13 – Some really interesting videos and example of apps helping a variety of people. 12:15 – And Tim Cook THANKS THE DEVELOPER COMMUNITY. WOW. 12:20 – New Air specs for MACBOOK: Ivy Bridge! Turbo Boost! 512 GB FLASH STORAGE! and USB 3!!! 12:21 – 11″ and 13″ (NEW SPECS AVAILABLE TODAY” but no updated display. Sorry Retina fans. CHEAPER PRICE POINT! YES! 12:21 – Now, the MacBook Pro. 12:22 – Basically same upgraded specs….no cheaper price point. 12:22 – UH OH! NO 17″ model displayed! WHAT?!?! 12:25 – INCREDIBLY thin new design. Not wedge shaped. Thinner than a finger. They are showing off cool ways that apps can help people and their businesses. 30 billion apps downloaded, over billion paid out to developers. App Store stats: 400 million user accounts, 650K apps, 225K iPad apps.